I met this lovely newlywed couple by a post in a forum that a friend of Vika Wedding Planner found. Luba, the bride, was looking for someone who could help her to organize her wedding day in Venice, she wanted a special ceremony with 16th dress and a dreamy atmosphere crowned with details that I will write you below. Often internet is magic, virtual meeting from Luba and Vika had created a nice understanding that is necessary to make the right atmosphere that the newlyweds were seeking, to crown their dream by getting married in Venice. The initial stages of the organization was to search for the best clothing suited to the characteristics of the bride and groom and to the setting of the rite. 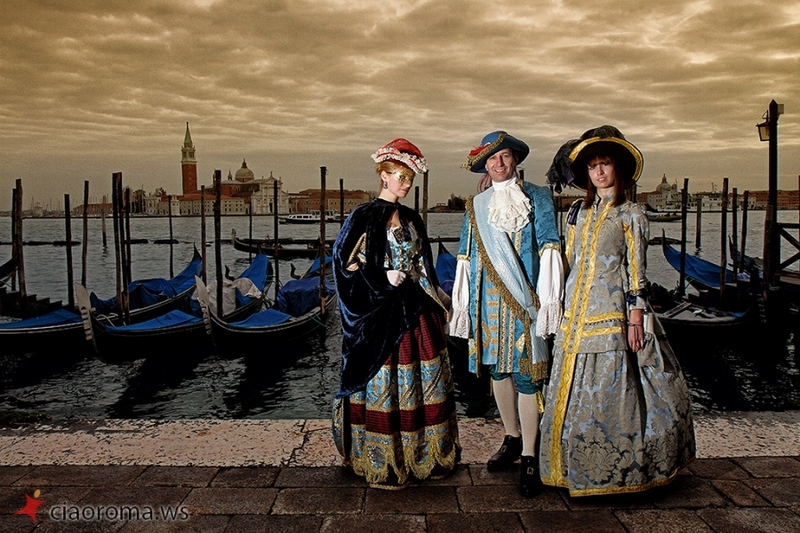 Vika chose to entrust this difficult task to one of the more important costume ateliers in Venice with hundreds costumes, gloves, shoes, hats, belts, feathers… everything that fit the 16th century. As location the newlyweds chose a Hotel in the central area of Venice, Palazzo Abadessa, furnished in Renaissance style, decorations that bring to mind the lifestyle of that time in the past: carpets and antique paintings, porcelain vases, huge chandeliers. To enhance the atmosphere the Wedding Planner entrusted an experienced violinist who played background music during the wedding. After the wedding ceremony two other musicians, a mandolin and an accordin helped to create an unforgettable atmosphere. To end the ceremony the bride and groom stepped into a gondola and released two white doves as a symbol of peace and joy. The wedding party followed the happy couple in gondolas enjoying the view of the city as they rode through the canals. The guests then awaited the newlyweds at the restaurant, close to San Marco square, La Cusina that has a gorgeous view of the lagoon of Venice. Vika and I had arrived in Venice very early to study the best photo locations for the newlyweds. At dawn we were already in the station and we could watch the sunrise over the lagoon, an image that still remains in my mind and in my heart. After a big breakfast we went to the hotel where the newlyweds were staying. Here we having checked the time line of the day and the newlyweds began to dress in their costumes. With them there was also groom’s daughter who wanted to be part of this unique wedding day. We started our photo tour as planned, capturing emotions and places that might leave them with special memories such in the little gondola dock; canals and little bridges that unite every part of Venice; masks in the store windows. Arrived at Palazzo Abadessa, we relaxed in the beautiful garden where we enjoyed the special views with a display of contemporary art. I made some interesting and very romantic shots here, before heading inside Palazzo Abadessa and the beginning of the ceremony. Inside the hall there was the violinist and Vika that in the meantime had changed dress to prepare to celebrate this symbolic ceremony. I took the salient moments of the ceremony, signatures, the exchanging of rings and of course I tried to capture the newlyweds emotions and the romantic glances between the eyes of the bride and groom during the celebration. After the ceremony, the mandolin and accordin men dressed in traditional Venetian costume, came into the room. They played during the little buffet organized for newlyweds. Helped by the champagne, everyone relaxed and I took advantage to capture some portraits of beautiful Luba and her husband Alexandr without missing the loveable daughter Anna. We went down to the main hall and went out through the back. A gondola and white doves were waiting. To be sure that I wouldn’t miss a minute of this event, I went to the other side of the canal. The gondola ride was accompanied by typical Venetian dialect of our gondolier that made our trip even more romantic and unforgettable. We landed near San Marco square, and spent the last shoots there but the tourists crowded around of and everybody want to participate on our photo session. The newlyweds weren’t very happy having so many people around them, so we decided to end our photography session here and go back to the hotel. I would like to thank Luba and Aleksandr, but also Vika Wedding Planner, who gave me the chance to participate in this special day, a very exciting and novel occasion for me. I leave you to enjoy some photos that I shot from 582 photos that I have taken! That is a good tip especially to those new to the blogosphere. Brief but very precise info… Appreciate your sharing this one. A must read post! just getting started to read and dreaming to do this awesome ceremony me too! I simply want to mention I’m all new to blogs and actually savored your blog site. Likely I’m likely to bookmark your blog post . You definitely come with beneficial stories. Thank you for sharing your website. Hi there I am so glad I found your blog, I really found you by accident, while I was researching on Bing for something else, Anyhow I am here now and would just like to say thanks for a marvelous post and a all round thrilling blog (I also love the theme/design), I don’t have time to go through it all at the minute but I have saved it, so when I have time I will be back to read a great more, Please do keep up the fantastic work.